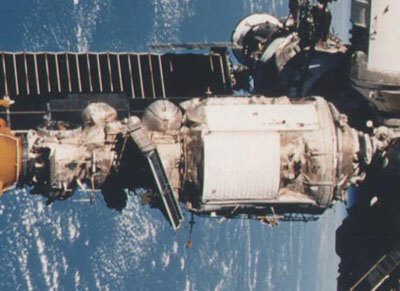 Mir's third expansion module, dedicated to materials processing, Kristall was launched by the USSR and carried equipment for research on semiconductors and the purification of biologically active substances to the space station Mir. It also carried astrophysical, geophysical and technical experiments. Kristall was 11.9 m long, 4.35 m in diameter. Solar arrays spanned 36 m. Its main body was similar to Kvant 2, with a multiple docking port instead of an EVA airlock module. The docking system was to host a future Buran visit, but was later used for Shuttle visits. The axial port was later coupled with the SO docking module to provide more clearance with the shuttle orbiter. The radial port of the docking port was never used. Kristall increased Mir's mass to 83 metric tons and restabilized the station, thrown off kilter with the addition of Kvant 2.